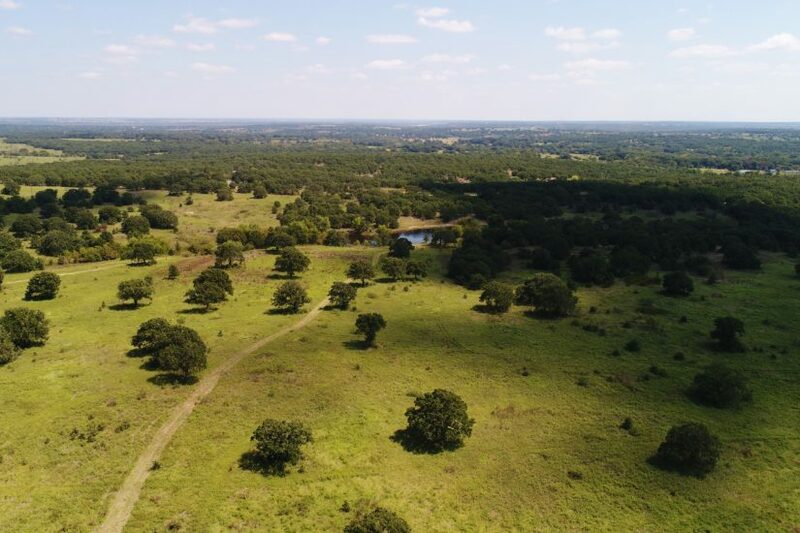 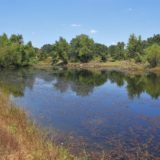 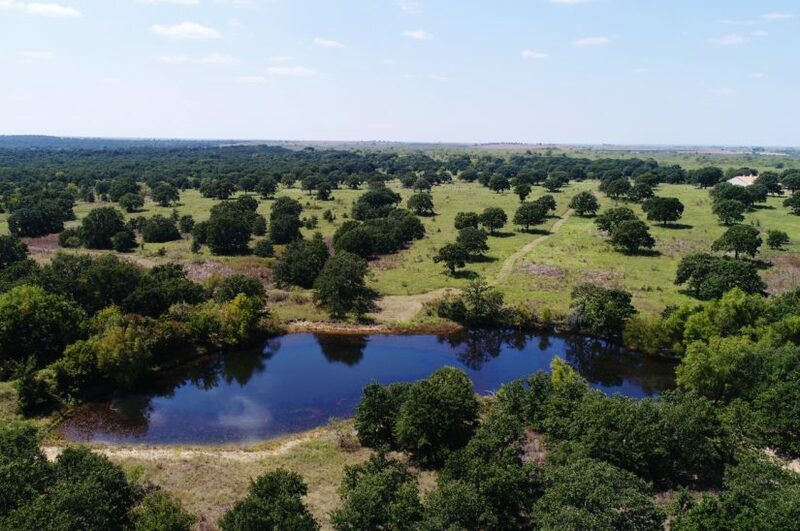 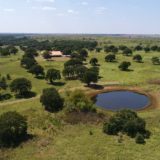 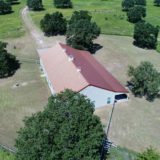 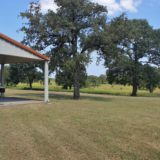 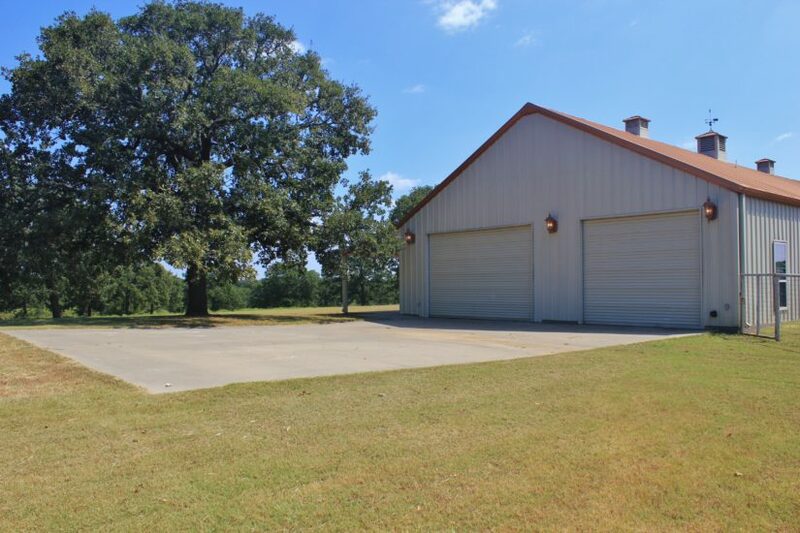 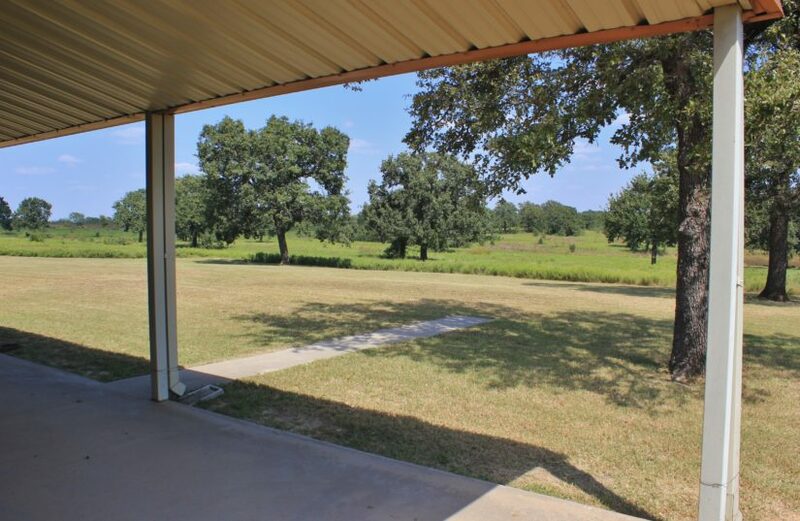 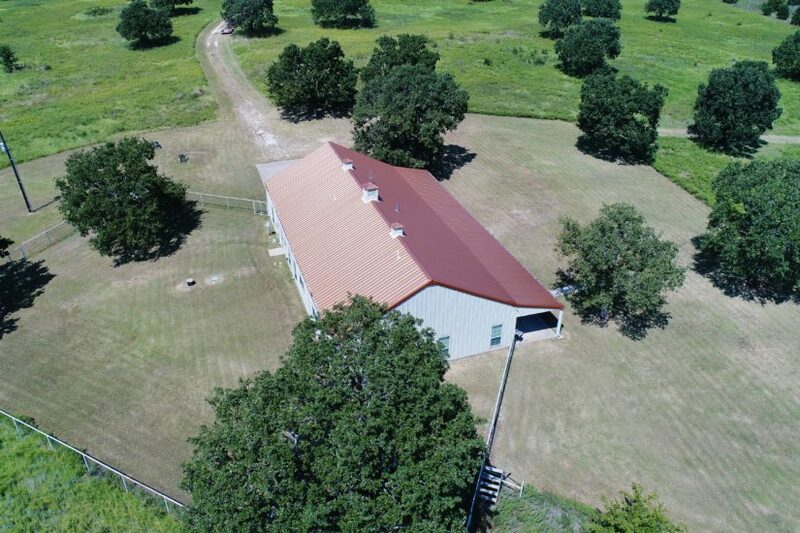 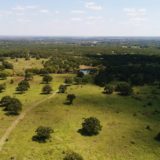 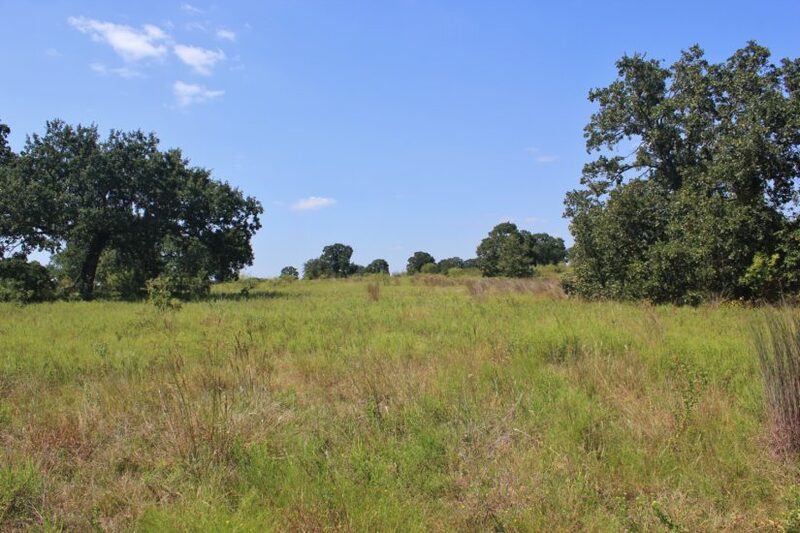 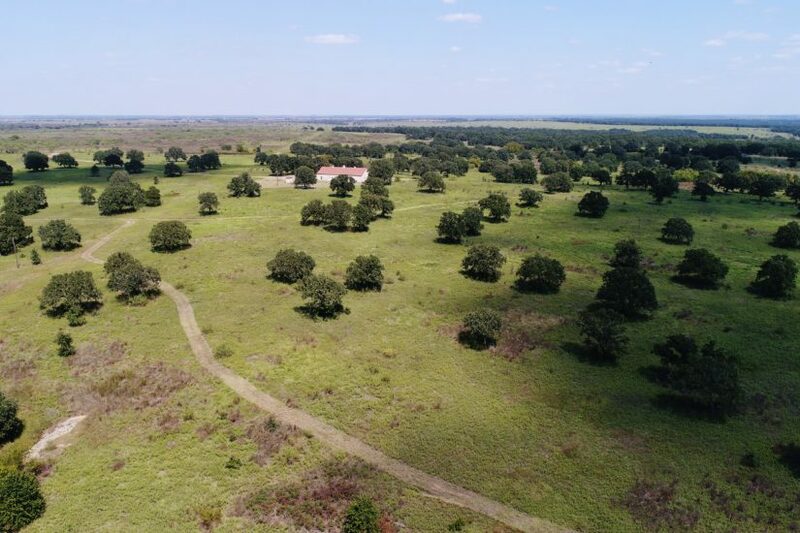 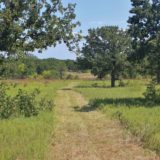 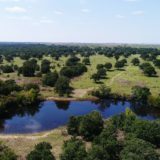 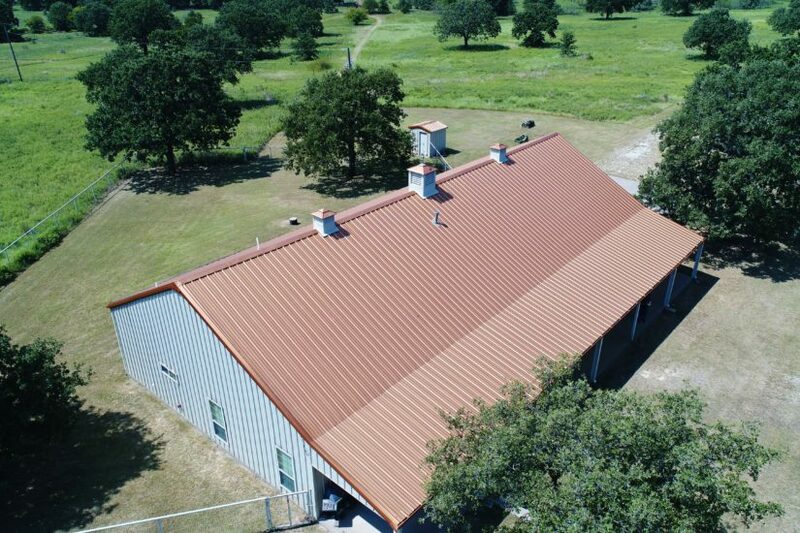 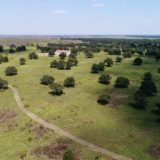 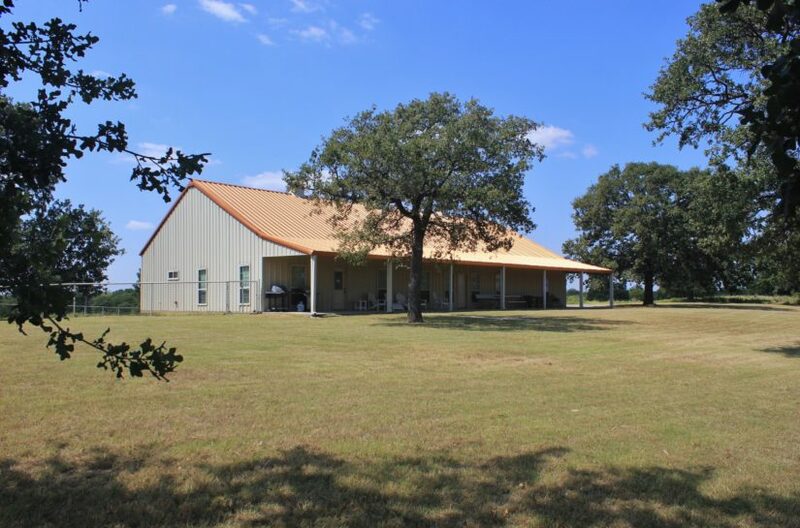 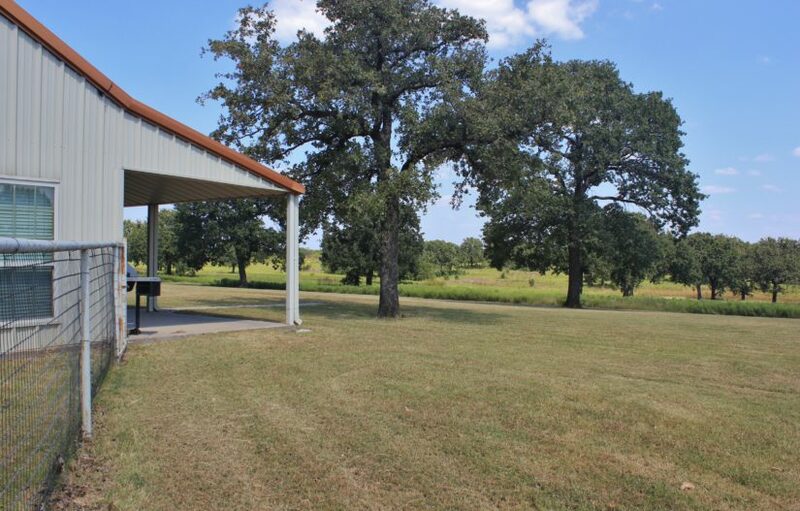 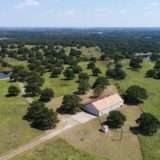 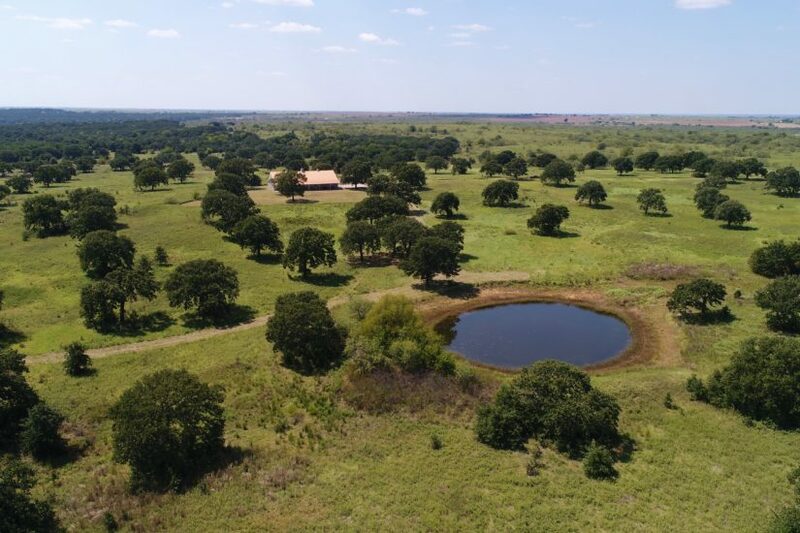 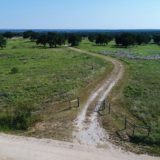 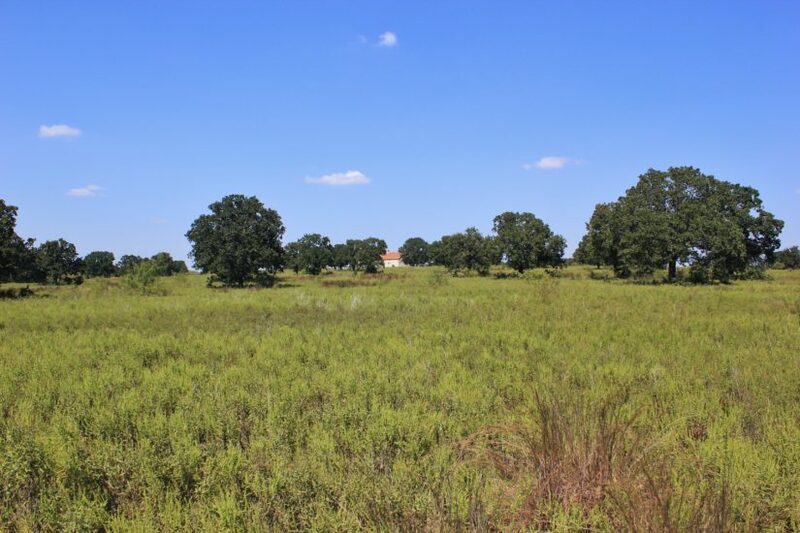 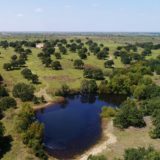 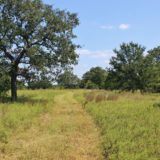 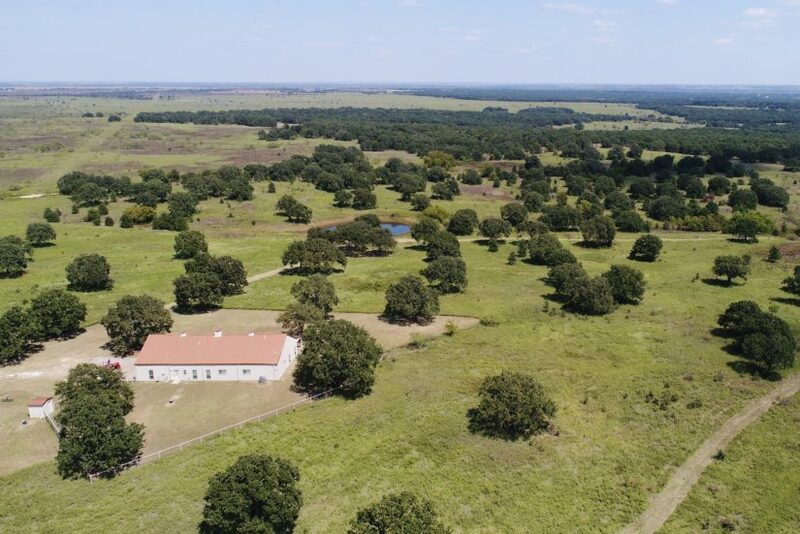 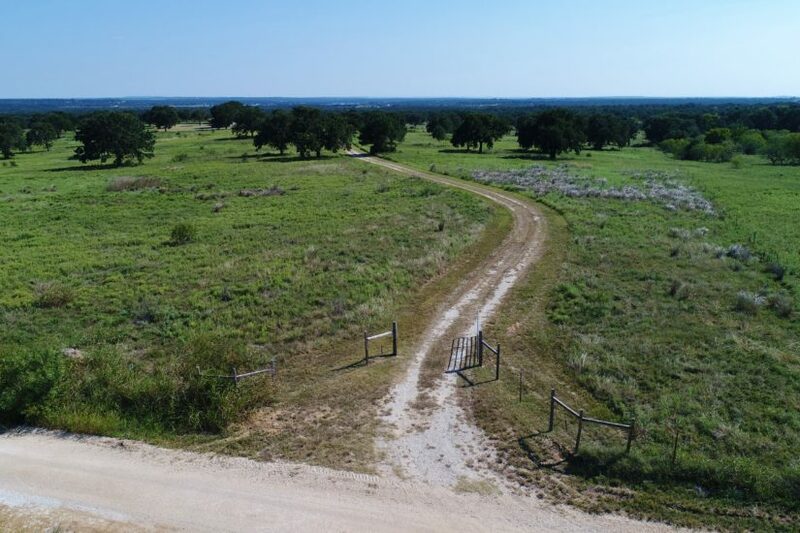 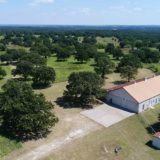 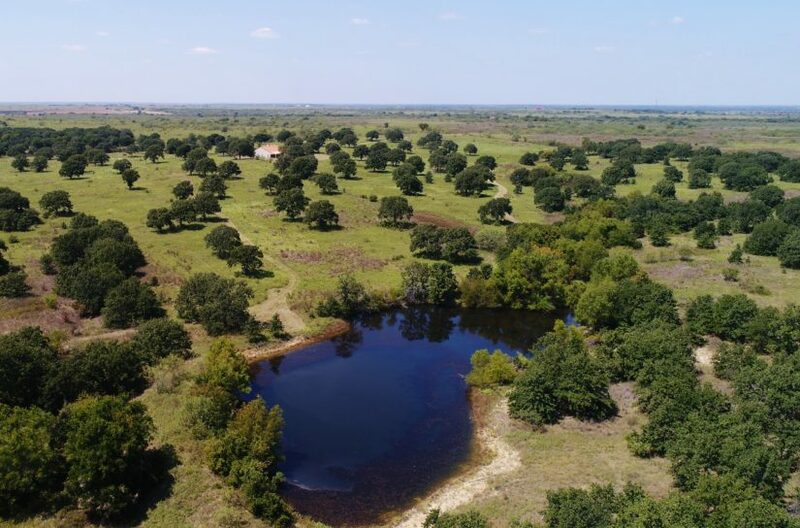 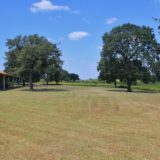 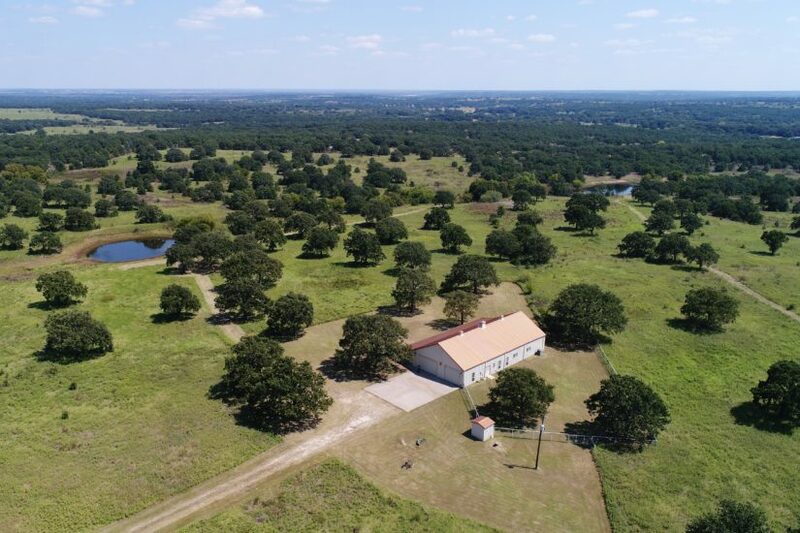 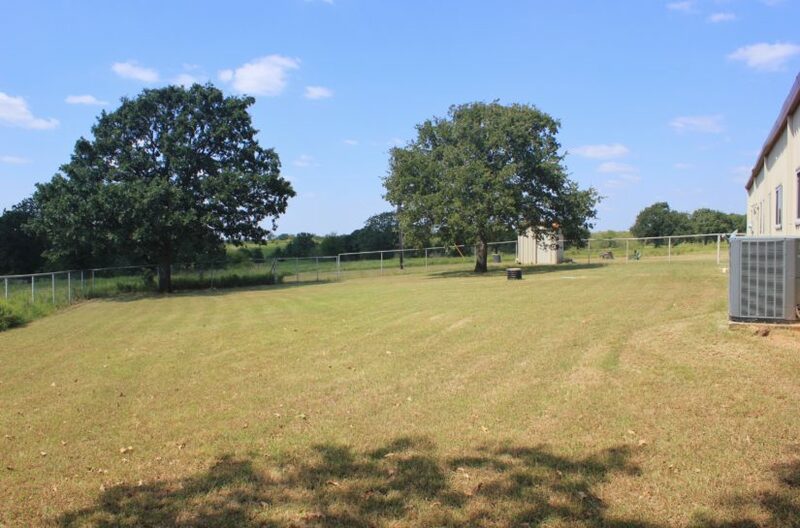 This 163 +/- acre paradise is located in the post oak groves north of Lake Nocona, in Montague County, Texas! 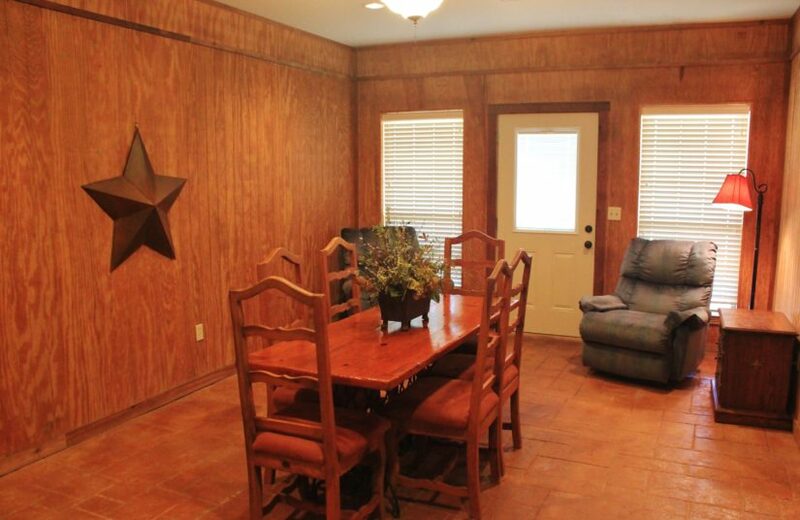 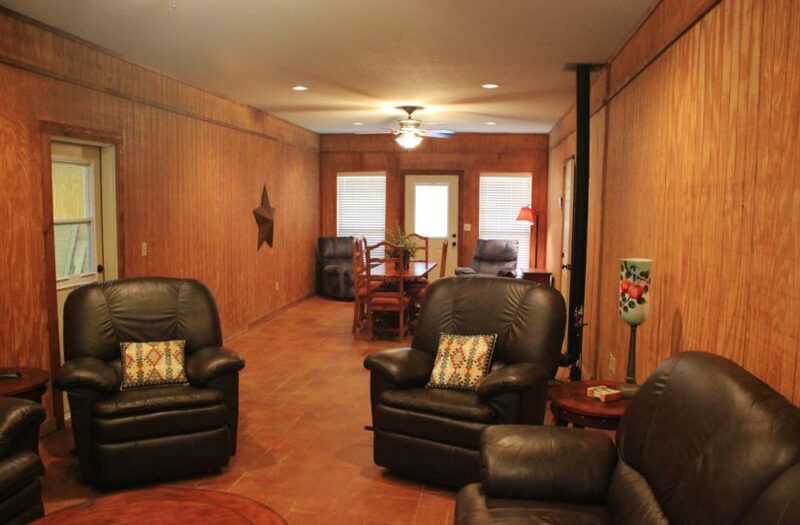 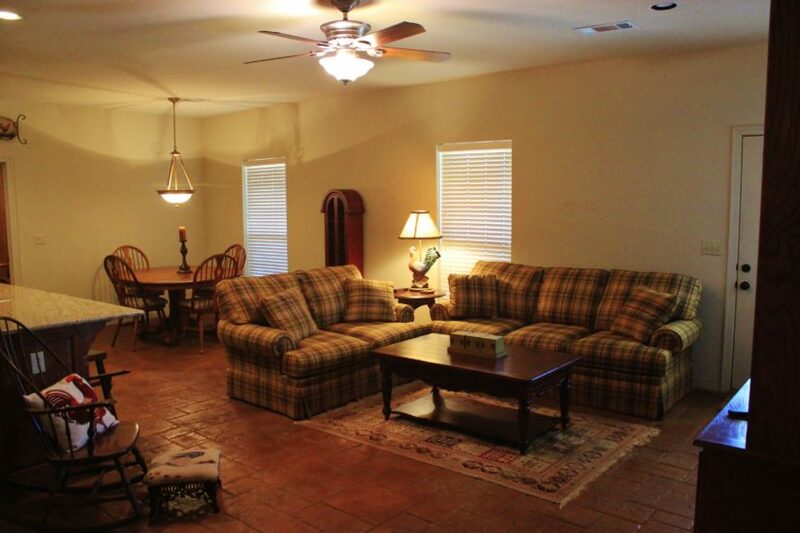 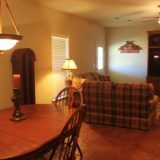 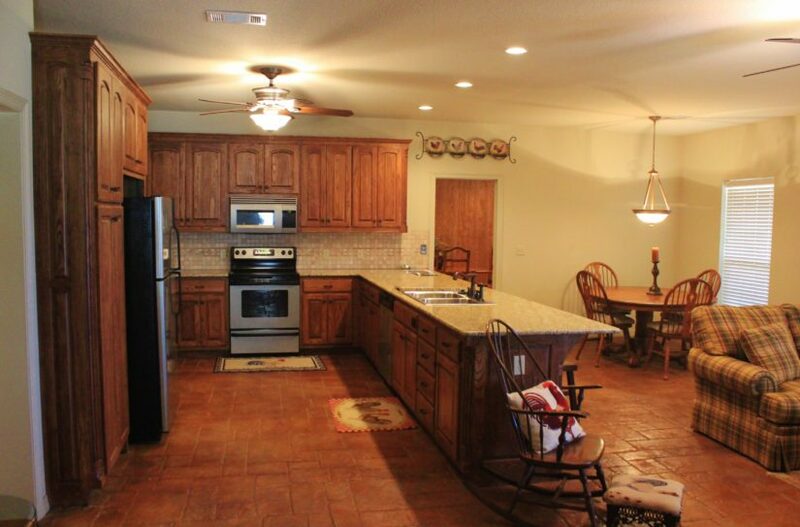 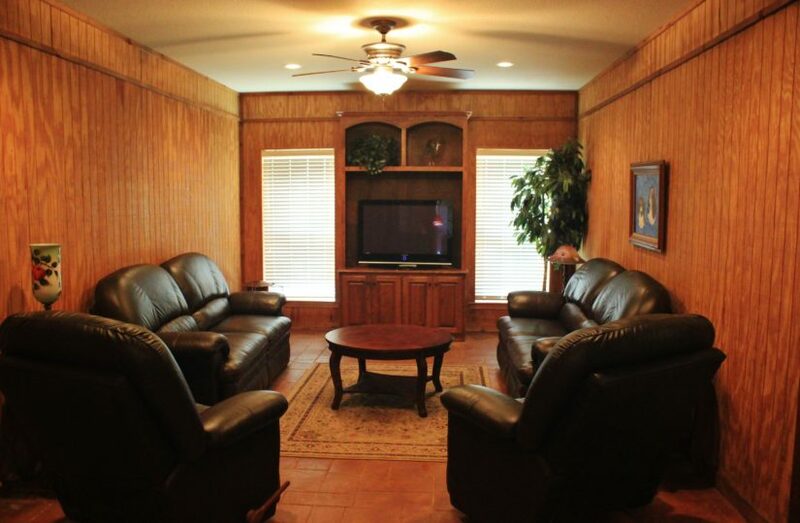 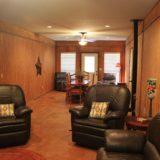 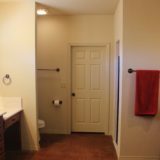 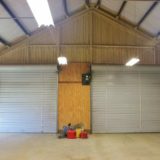 The ranch comes with a fully furnished barndomium house. 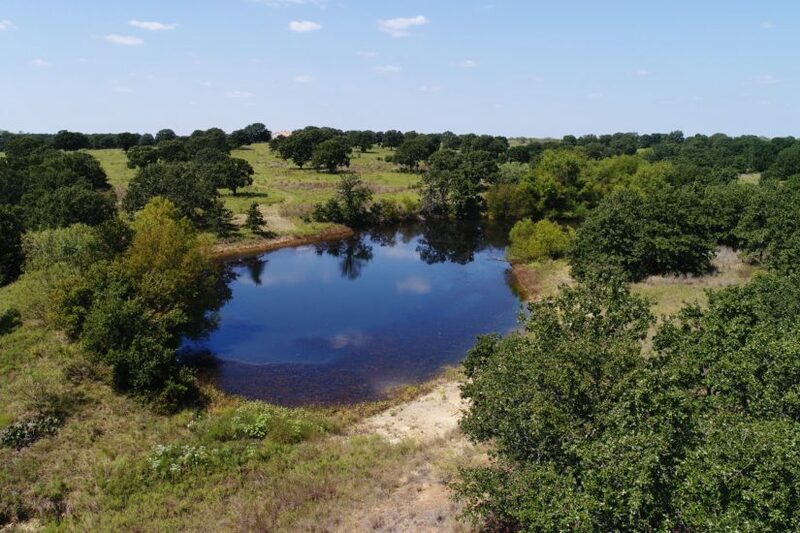 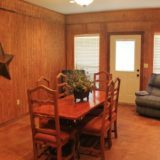 The land is absolutely beautiful and full of mature oaks, has two ponds, and lots of native grass. 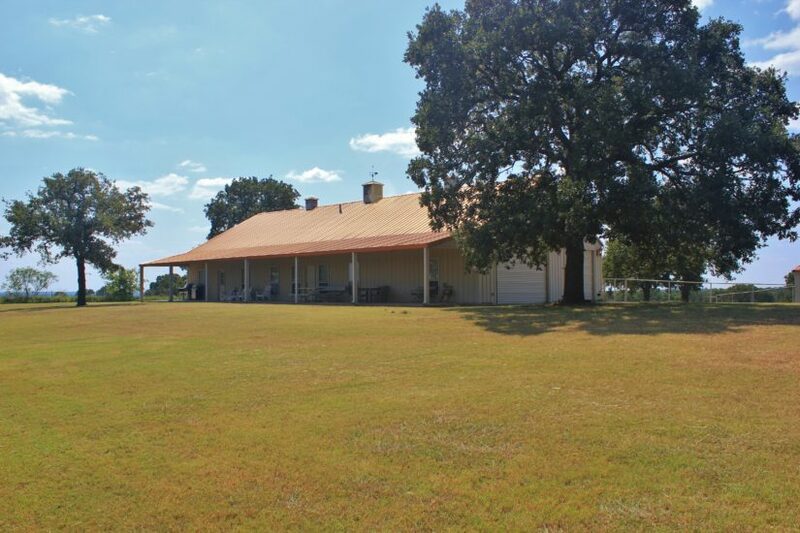 The house was built by the owners in 2006, shortly after the ranch was purchased. 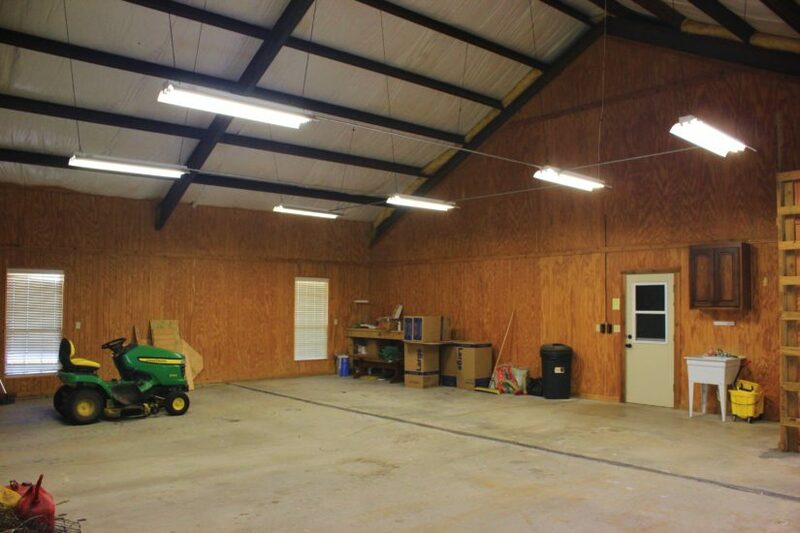 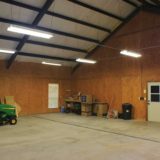 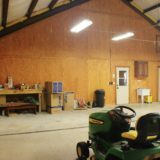 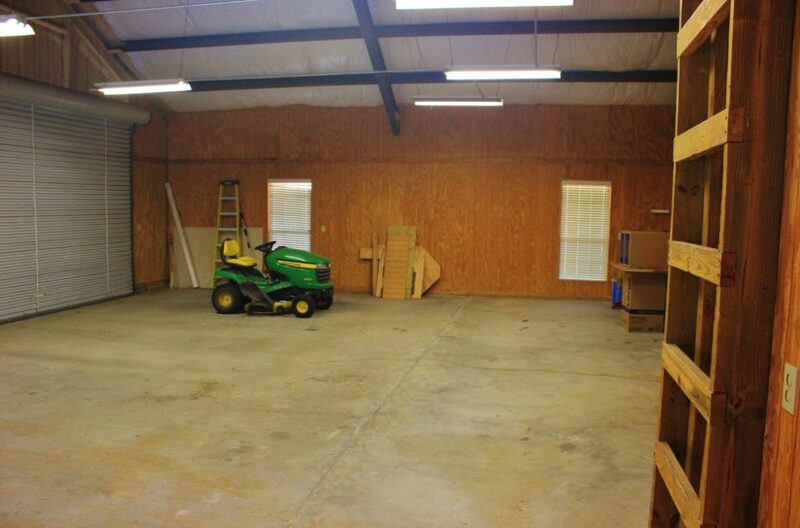 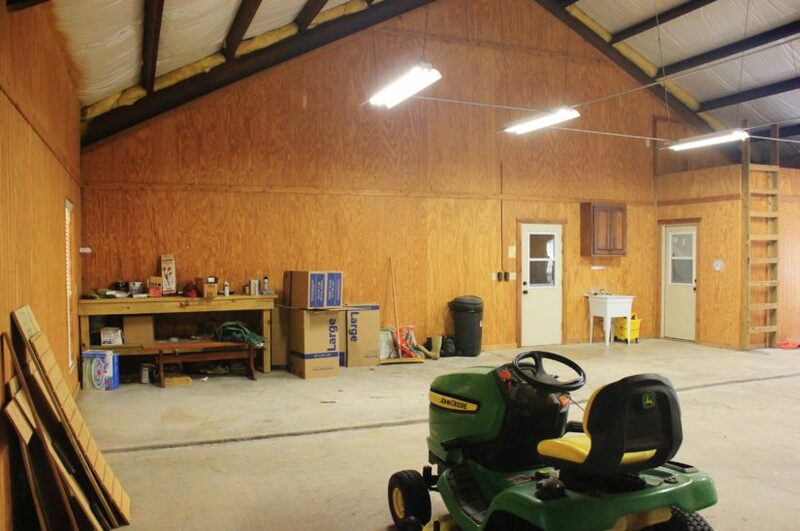 They picked out a wonderful location to put it in the middle of the acres, approximately 850′ off of the county road. 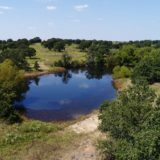 Electricity was ran over a mile to get to this location, and a new water well was drilled. 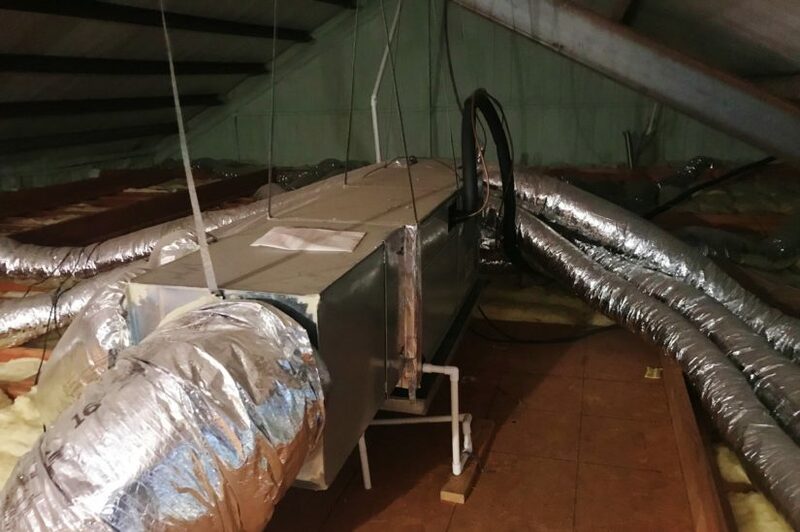 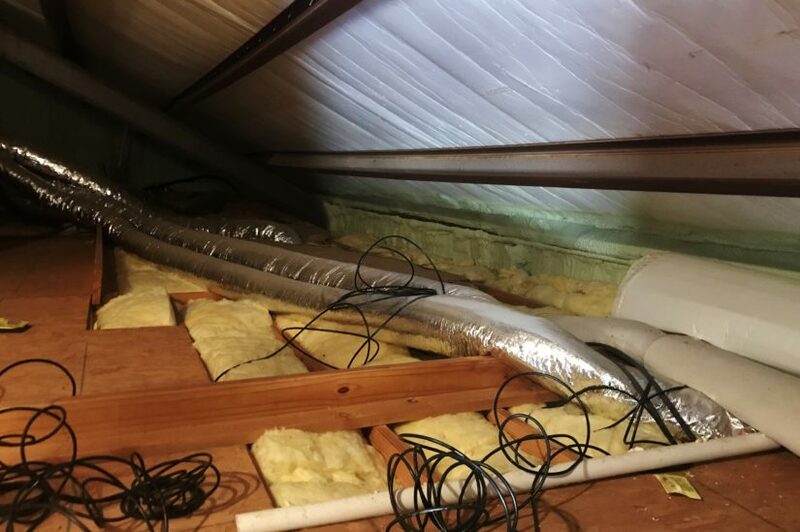 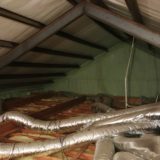 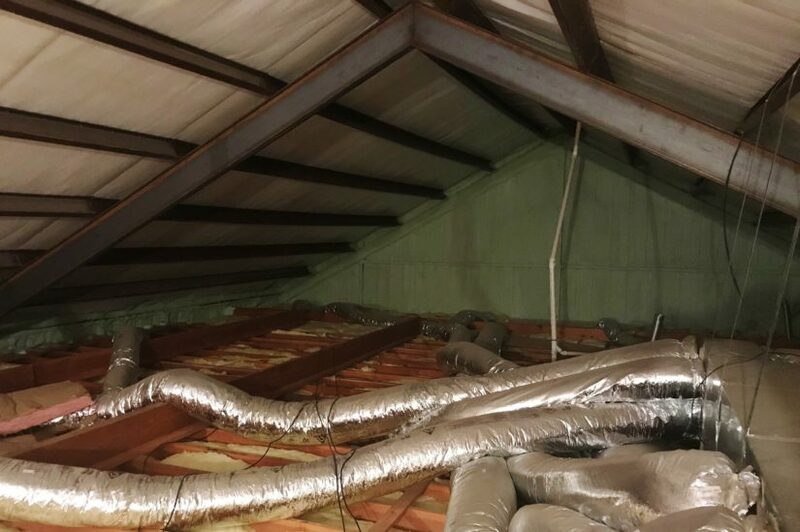 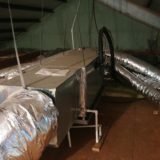 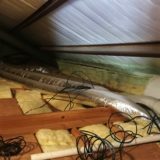 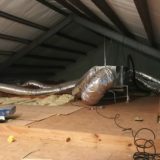 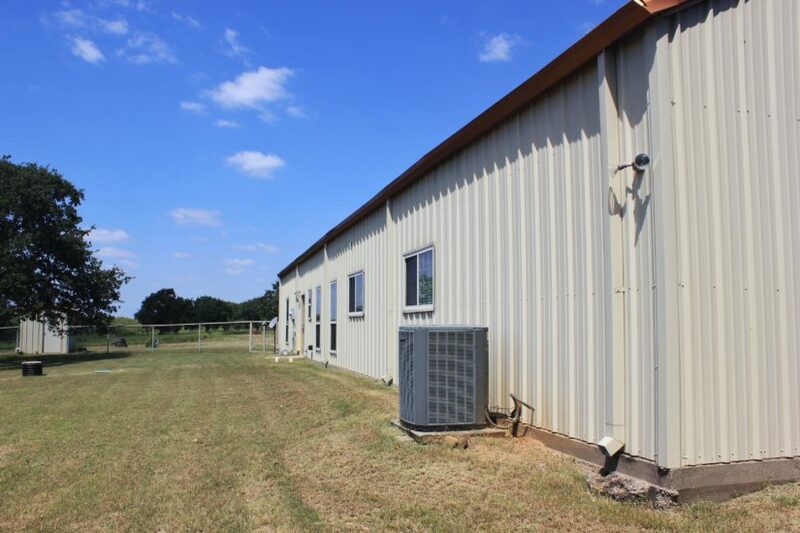 This home is extremely well insulated and has a metal exterior. 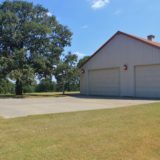 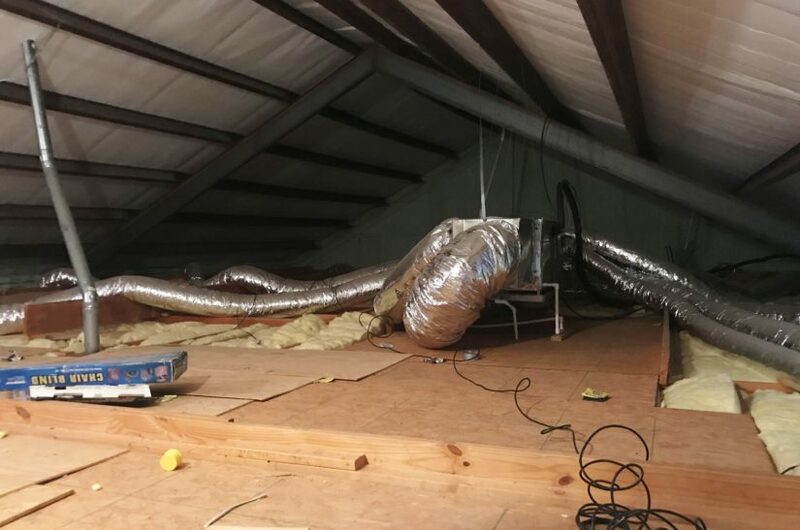 Per the tax district, it has 2,184 sq ft of living space, with an attached 1,428 sq ft three car garage that is insulated too. 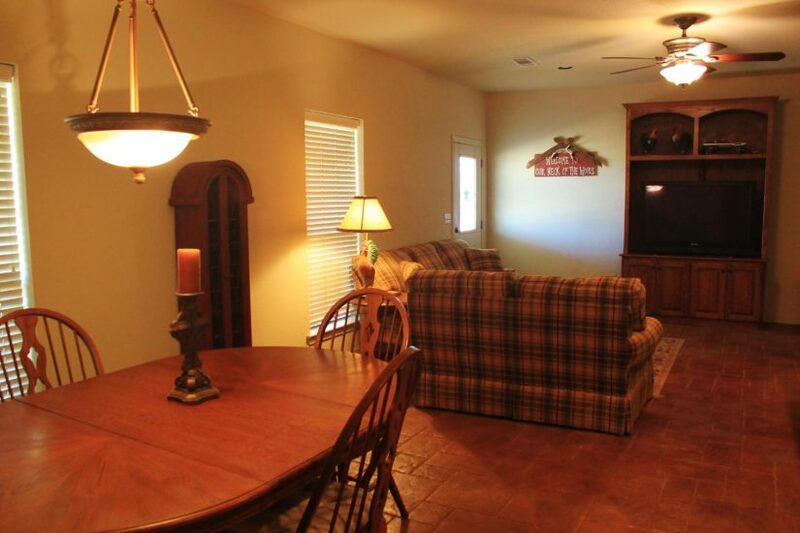 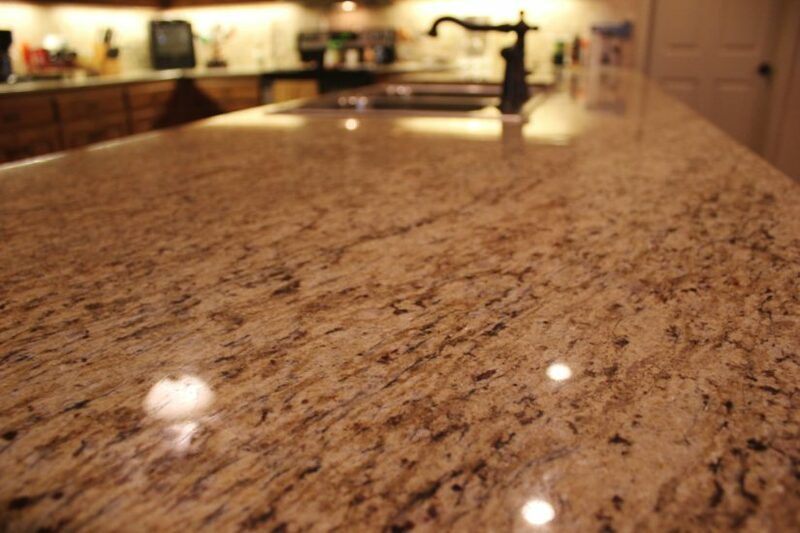 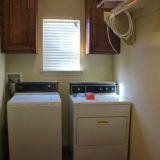 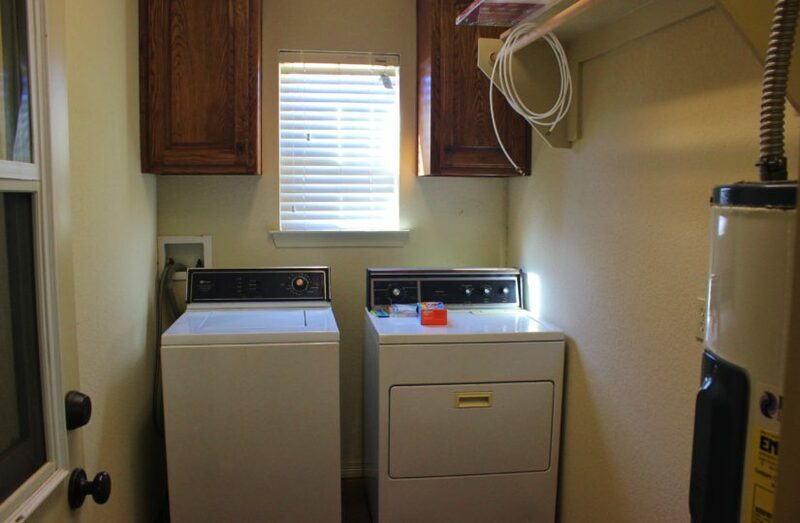 The home has three bedrooms, two bathrooms, two living rooms, CH/A, a wood burning stove, and granite countertops. 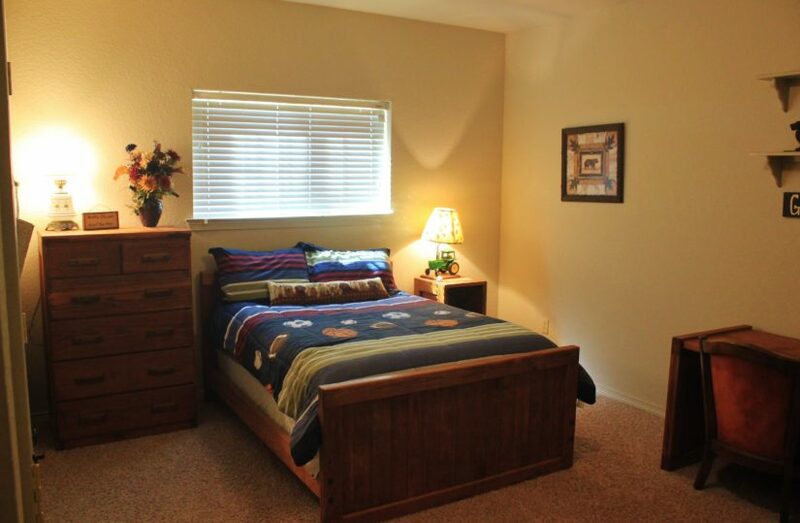 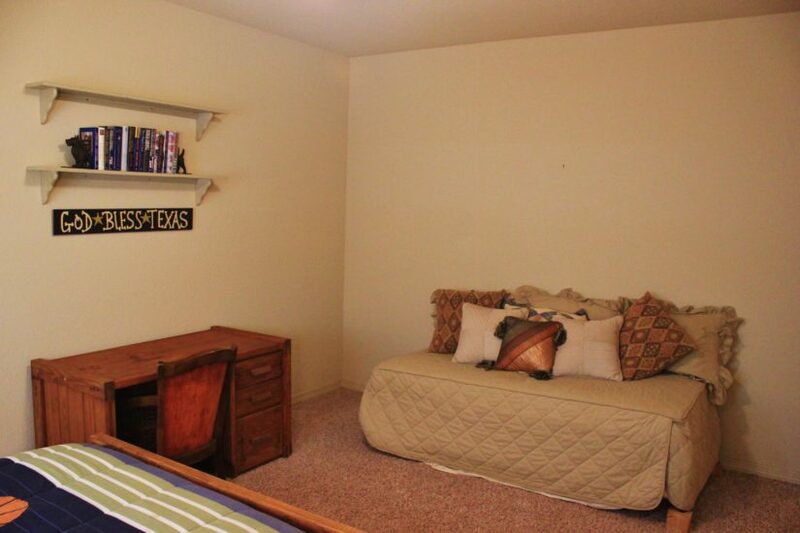 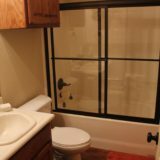 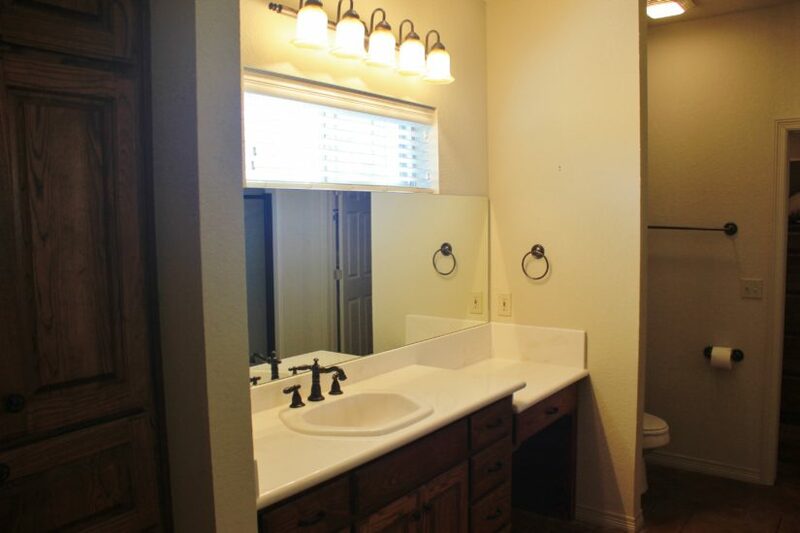 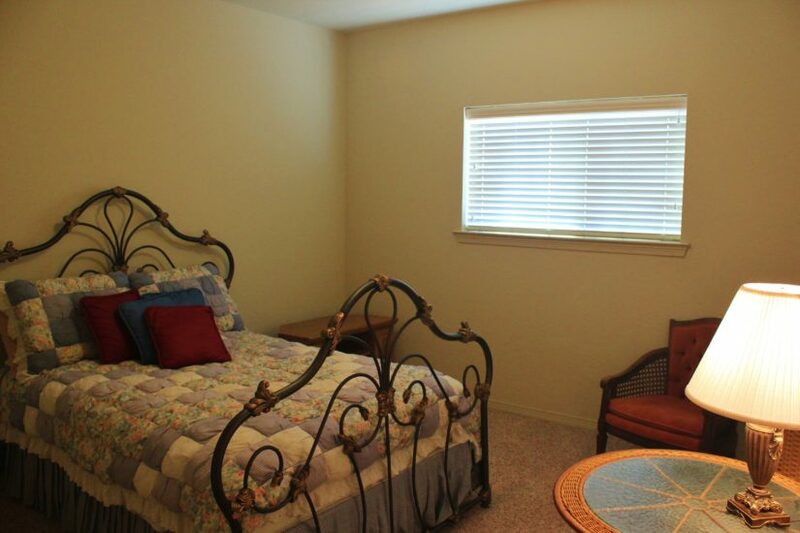 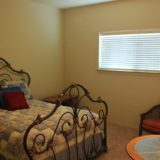 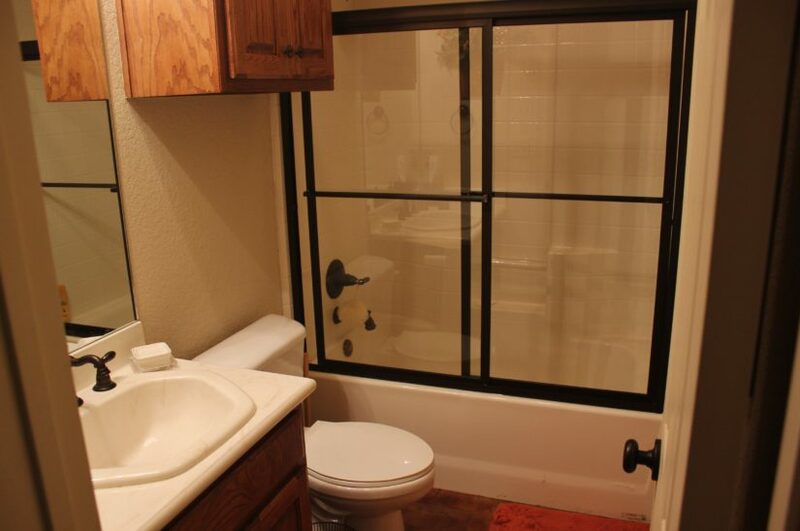 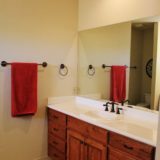 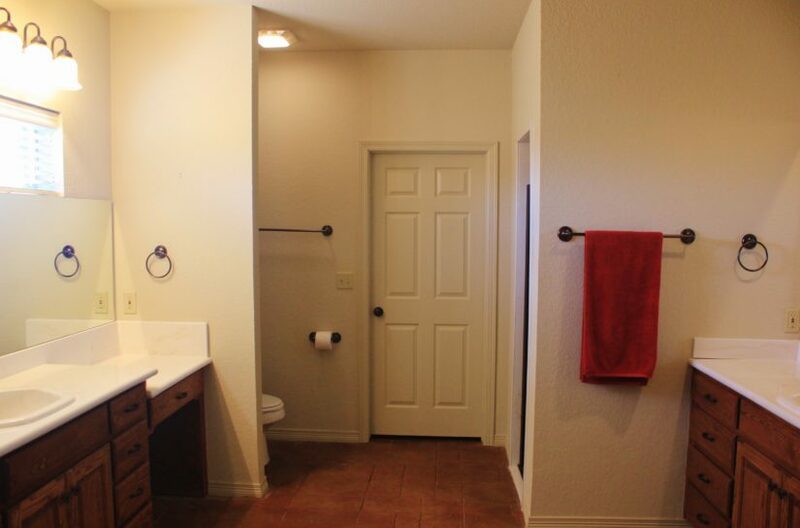 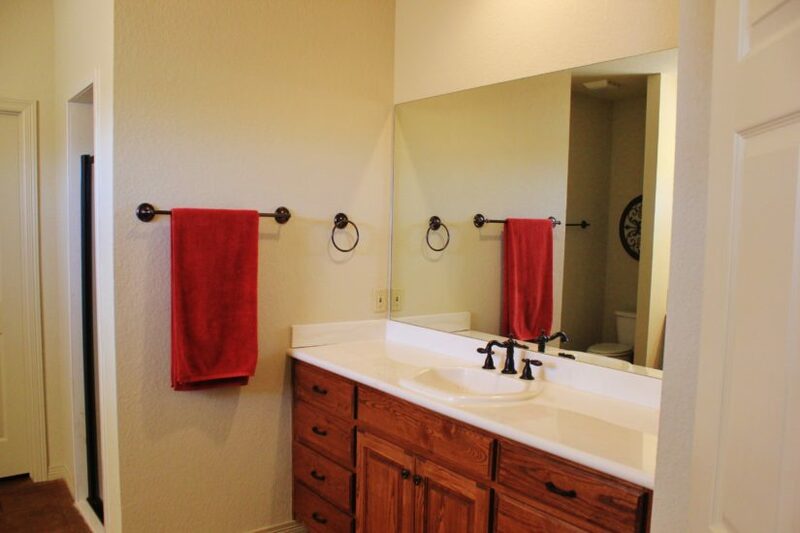 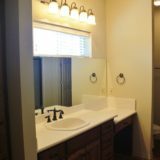 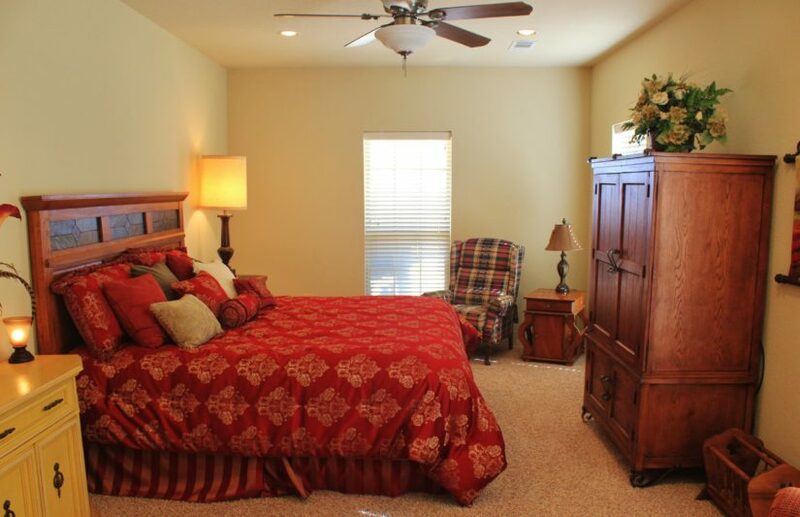 The master bedroom has a large private bathroom with dual vanities, tub, separate shower, and huge walk-in closet! 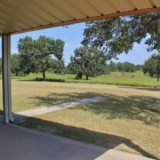 Outside the house is a fenced backyard. 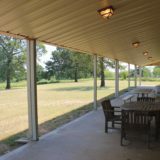 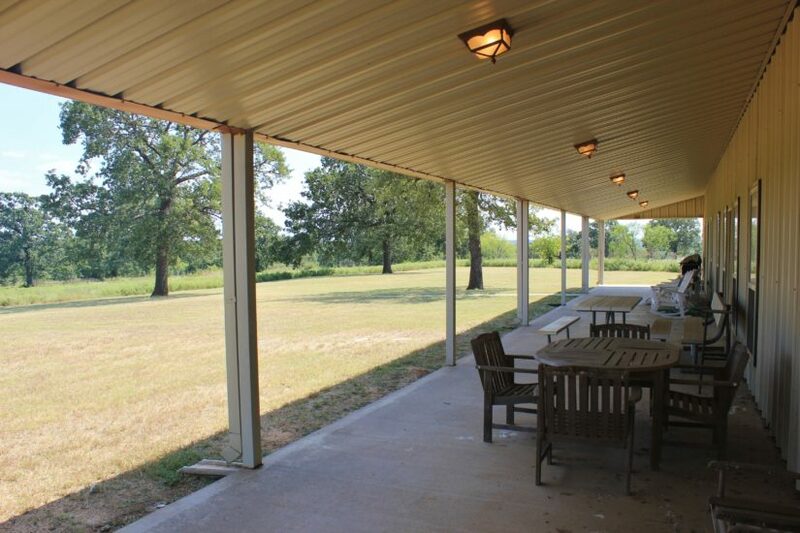 An 80′ long covered porch along the front provides ample space for cooking out and relaxing outside. 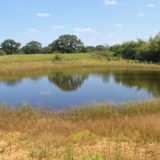 One of the two ponds is located just down from the house and can be seen from the porch, so you can watch deer come out to water in the morning and evening. 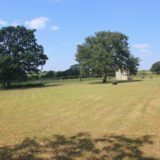 Oak trees surround the home and yard. 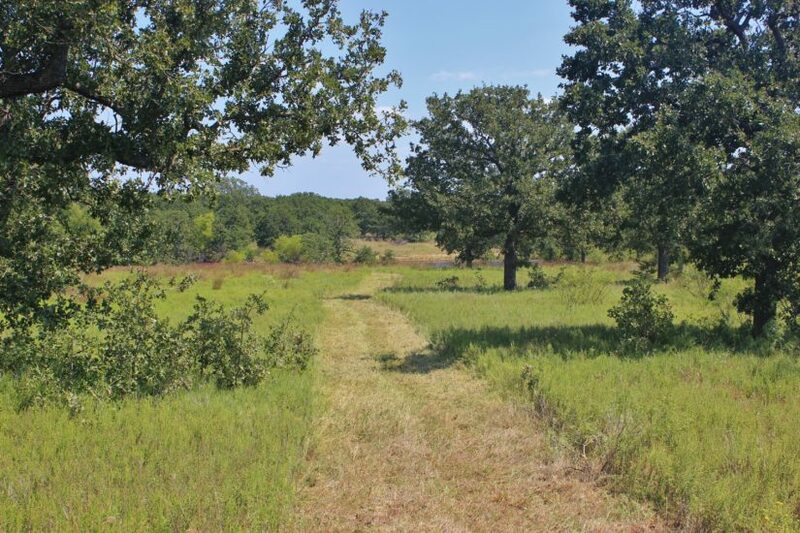 The land is all native pasture with a gentle slope to it; a creek ravine runs across the east side that feeds the main pond in the back. 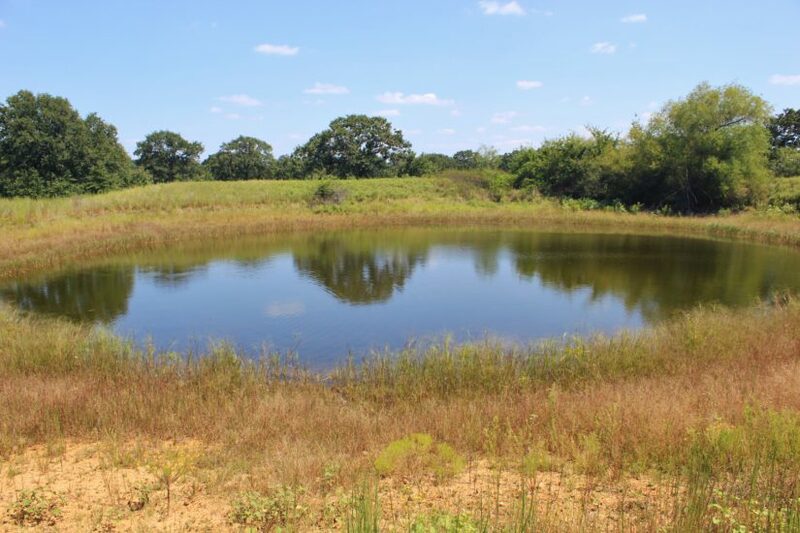 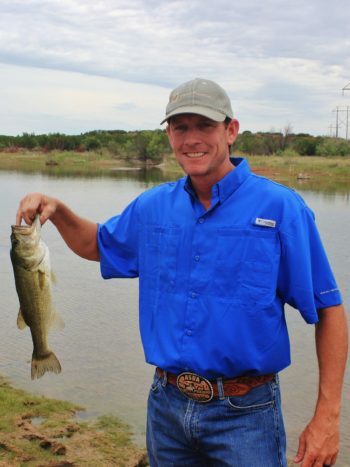 This pond is established and stocked with bass, almost one acre in size. 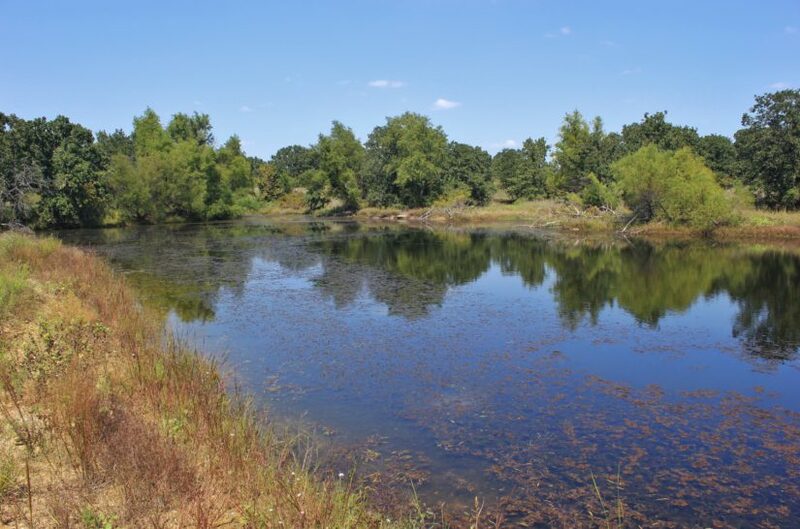 Surrounded by tall trees, it’s a great place for fishing, swimming, and just enjoying the peaceful country. 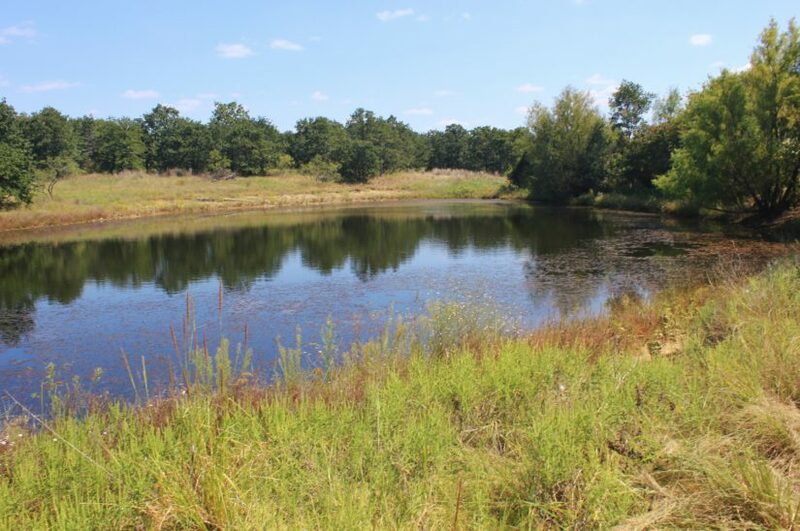 The other pond by the house is stocked with bass too, so there’s two fishing tanks on the property. 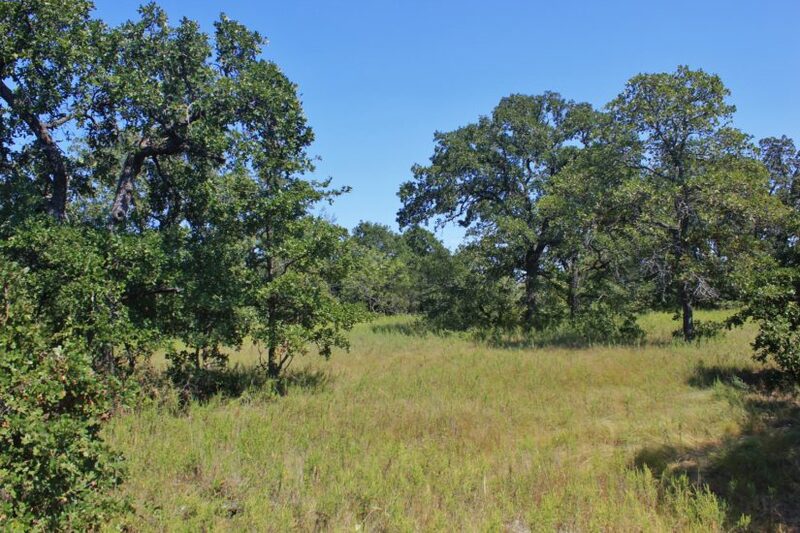 The whole ranch has huge, mature oaks across it, but they’re not so thick you can’t see through them. 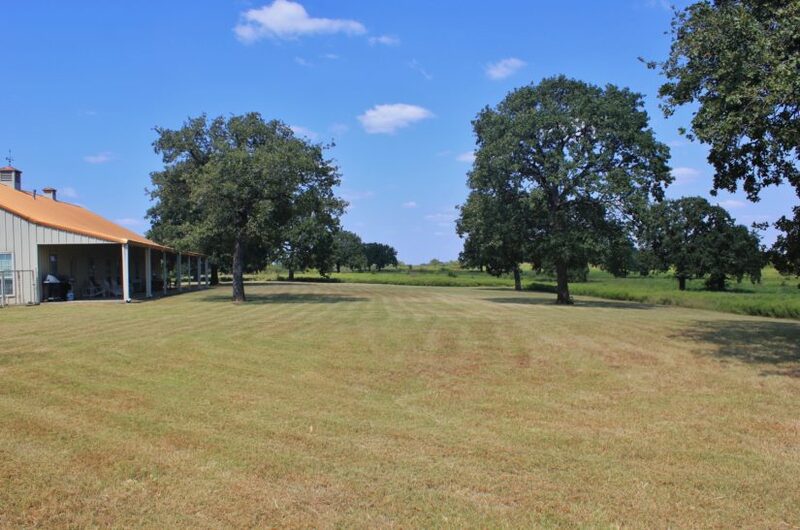 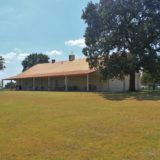 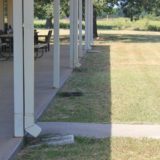 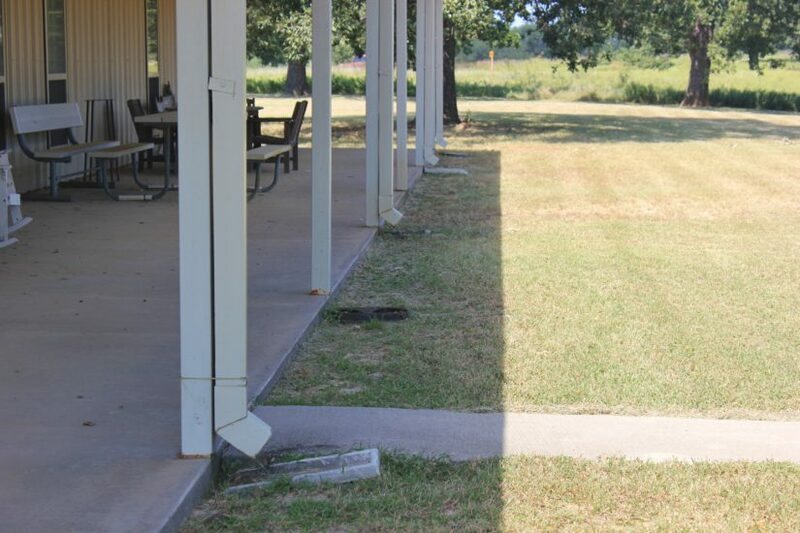 In the past, the owners used to hay the pasture grass in between the trees on the west side. 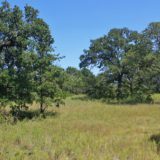 Wild plums and other midrange brush are here too, creating a perfect wildlife habitat. 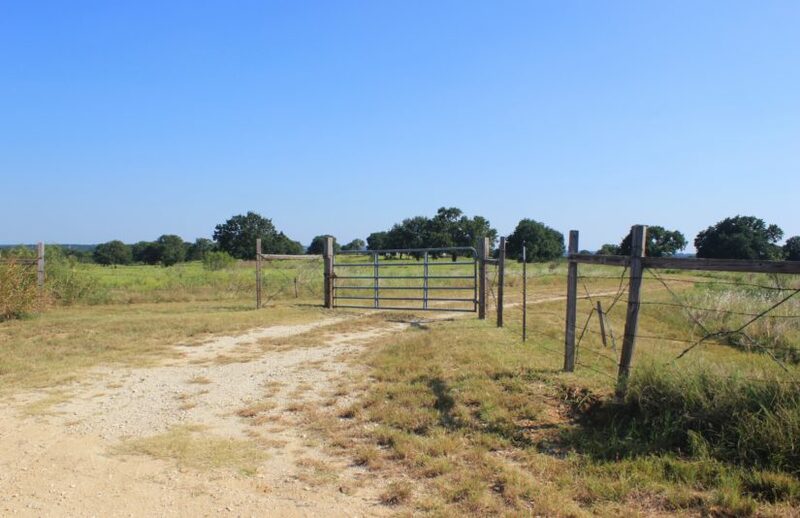 The land is cross fenced evenly into two pastures, so you can rotate cattle if you wanted to as well. 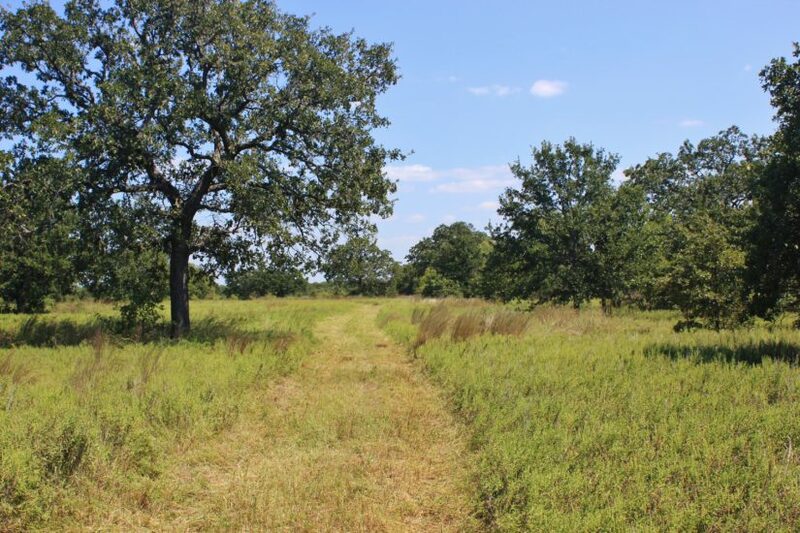 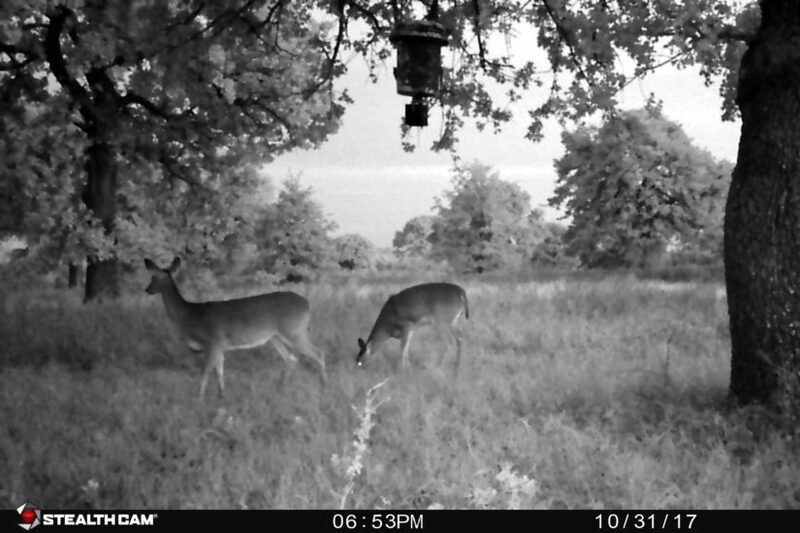 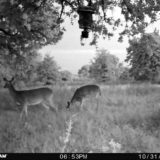 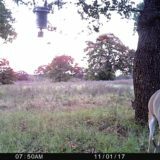 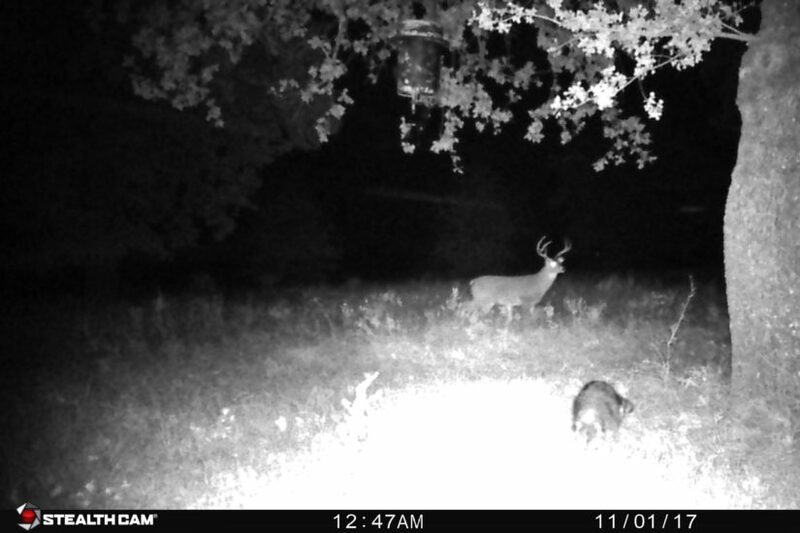 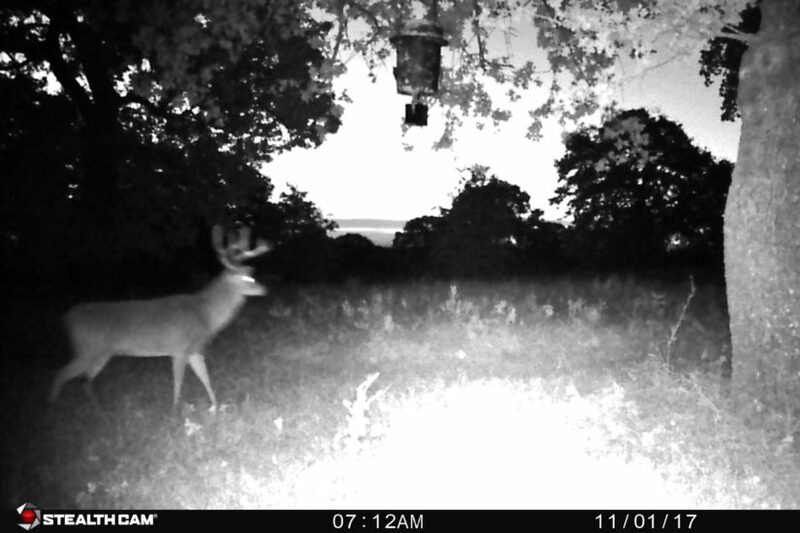 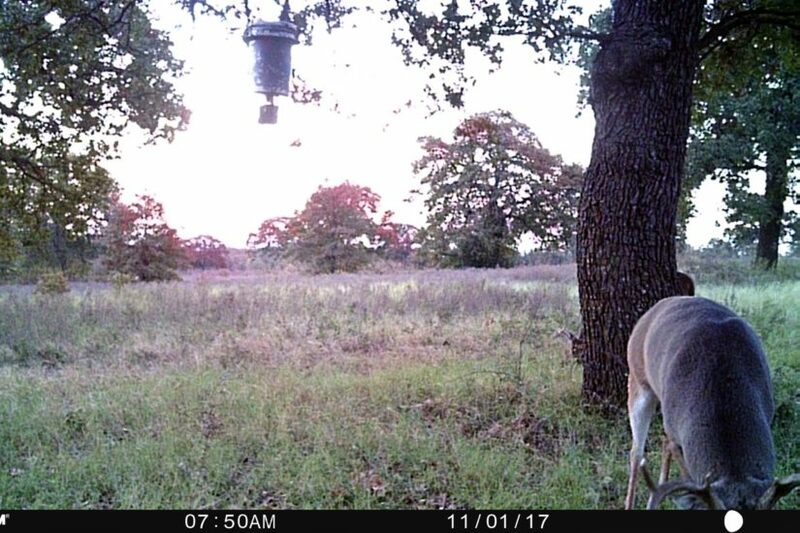 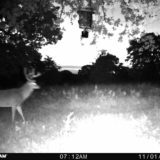 Hunting here is excellent for whitetail deer, turkey and feral hog. 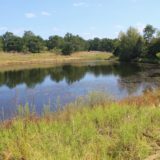 You may also find a bobwhite covey or two, as well ducks and other migratory birds down on the back pond. 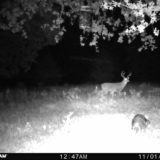 The property has been only mildly hunted by the same tenant over the last ten years. 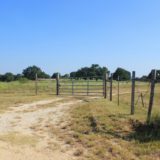 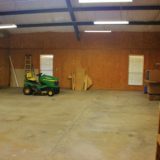 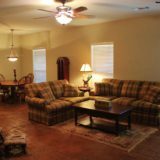 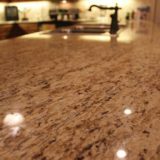 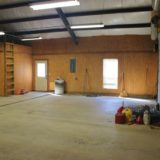 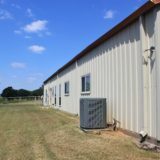 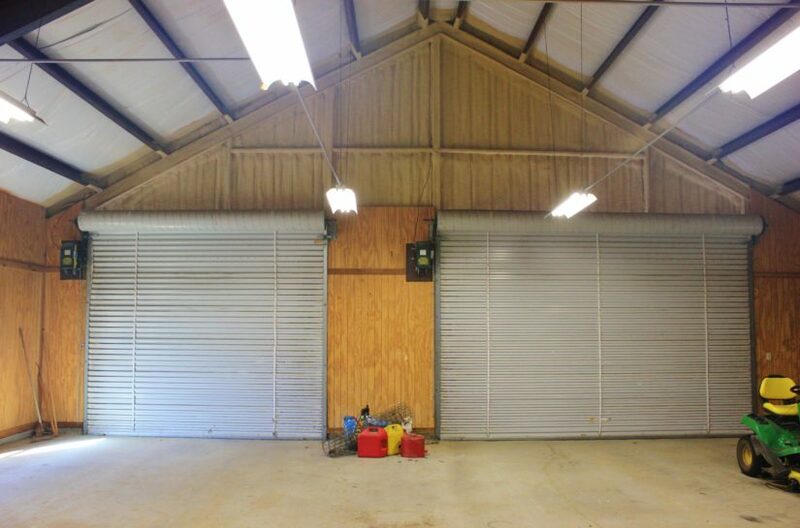 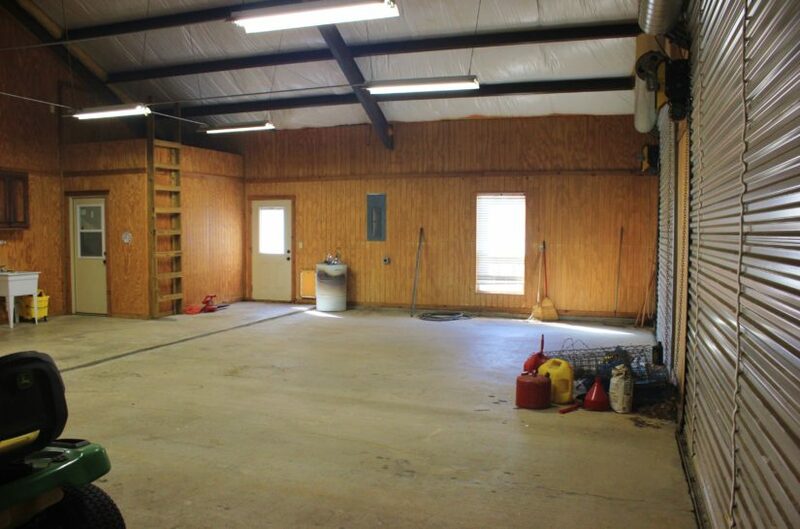 This lease was cancelled when the ranch was put on the market, so there are no leases to assume. 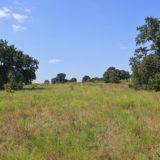 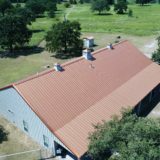 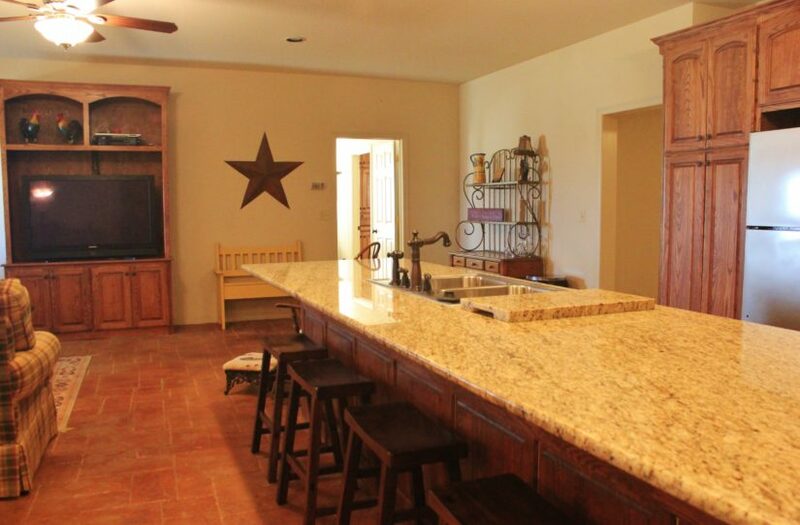 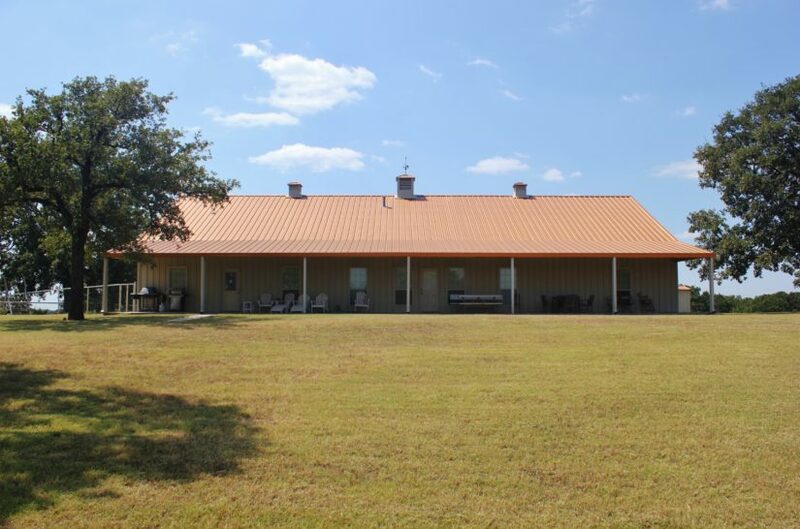 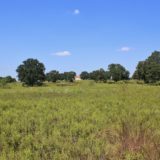 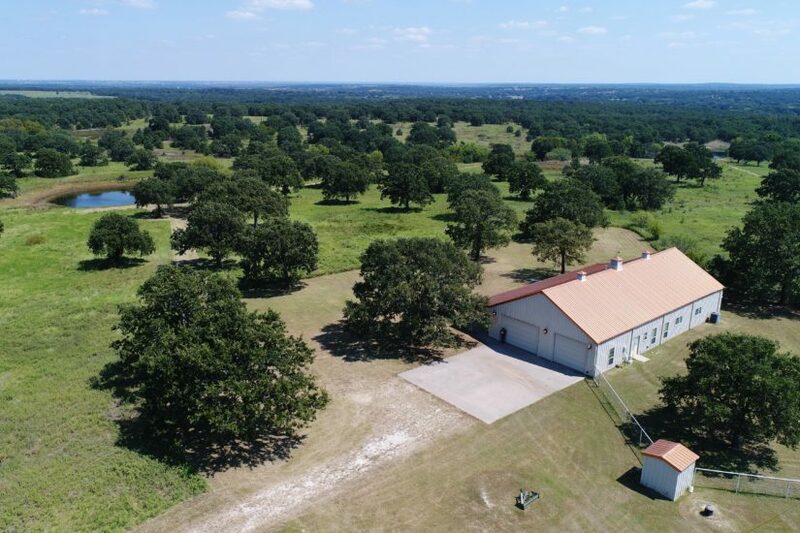 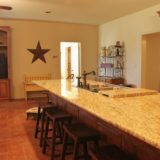 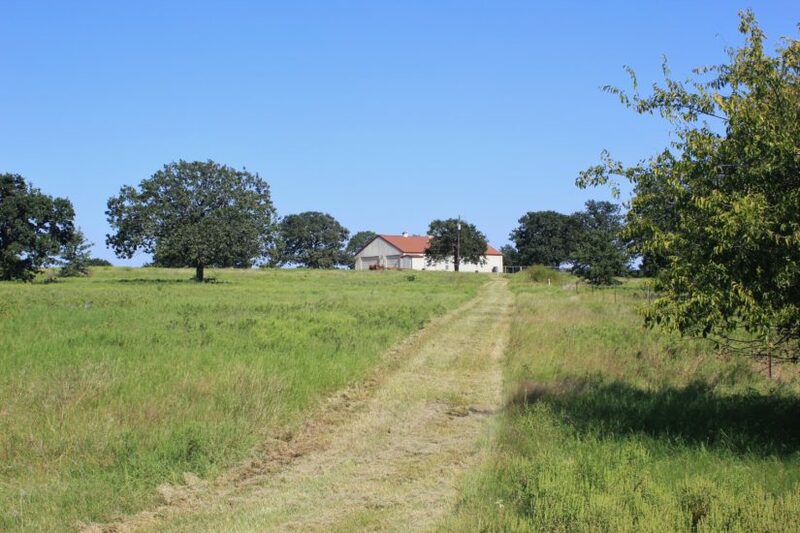 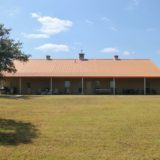 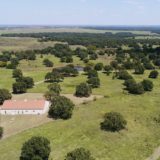 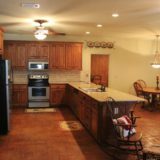 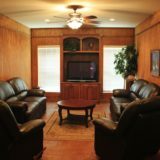 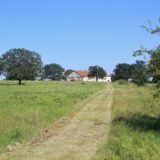 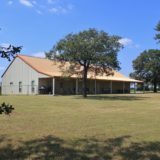 To see this beautiful North Texas Hill Country property in person, contact agent Beau Byars at cell phone (940) 224-3183.